This is my first post from my ongoing project restoring my PK50XL 91 model. It has been a complete "nuts and bolt" restoration. 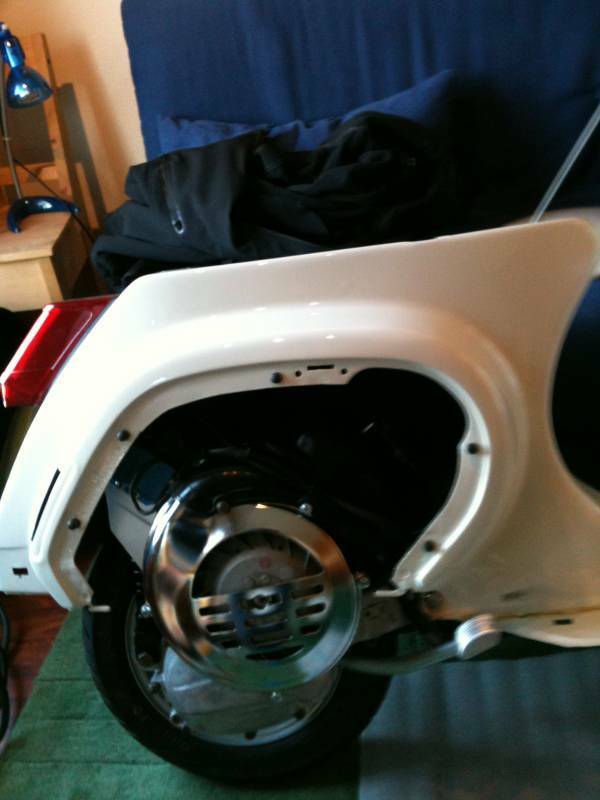 At one point i decided to spend whatever it takes to get the scooter back on the road. 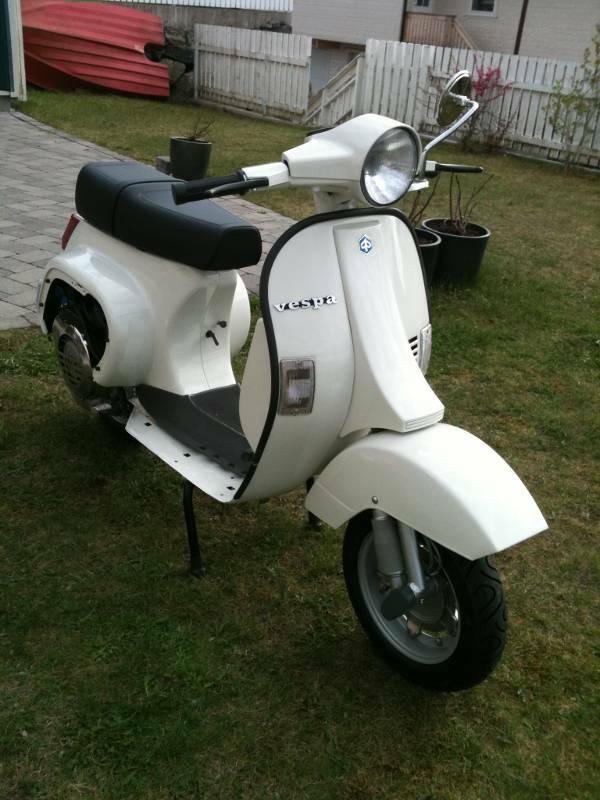 When I add up all the money spent and manhours, it would almost be better if i bought a brand new Vespa 50 ccm. Yesterday i fired it up for the first time. Made me scream out loud: "It is alive!!!". Now it is just a few tweeks before it is complete. I will now publish photos from the prosess on this site. That's a great feeling to have had the motor in pieces and then put it all back together and have it work. 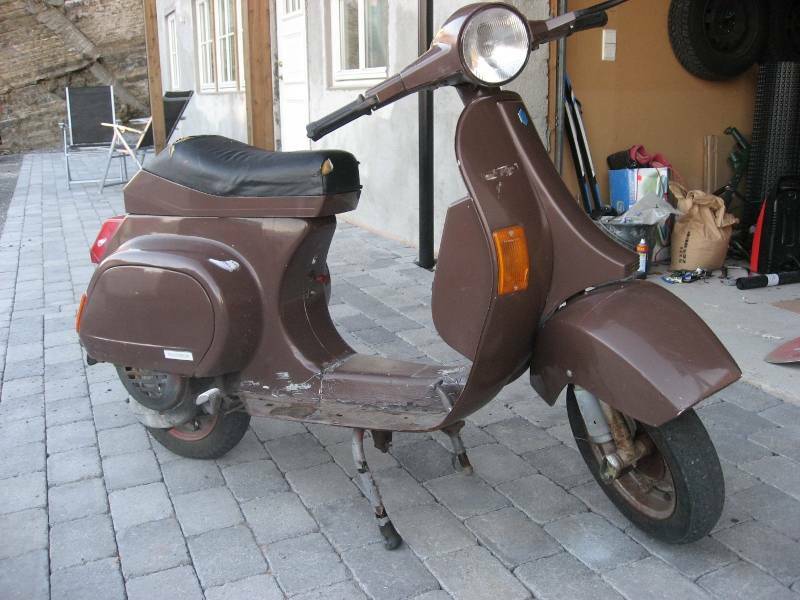 The scooter has, on this pic, its third color. Since new, it has been painted white, red and now brown. Quite ugly. 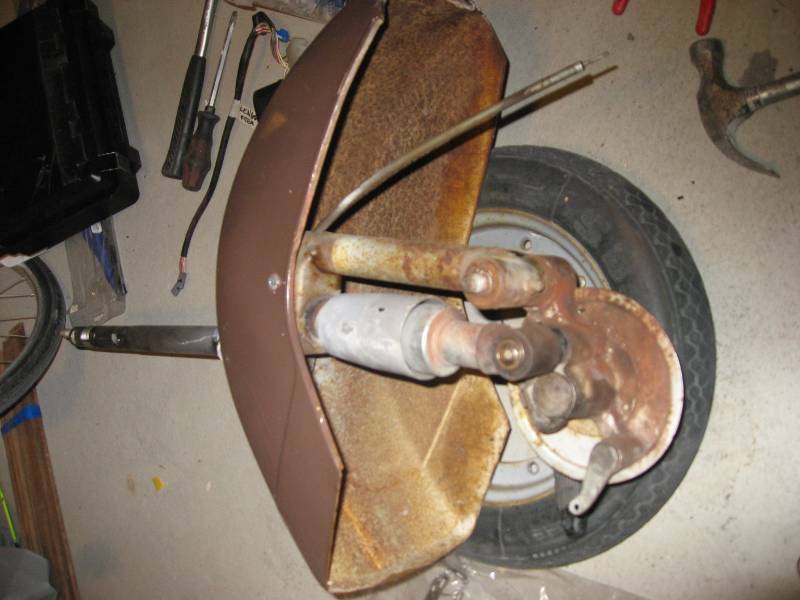 As i dismantled the scooter bit by bit i realized that this scooter was in a bad condition for a 91 model. Sanding was out of the question. Sandblasting was the only alternative. The front end bearings had not seen grease since god knows when. The fork bearings came out in bits. Merde! Finally all the pieces where in marked plastic bags. Photos taken of every bit and how it was fastened so I would not forget how to put it together later on... much later on. 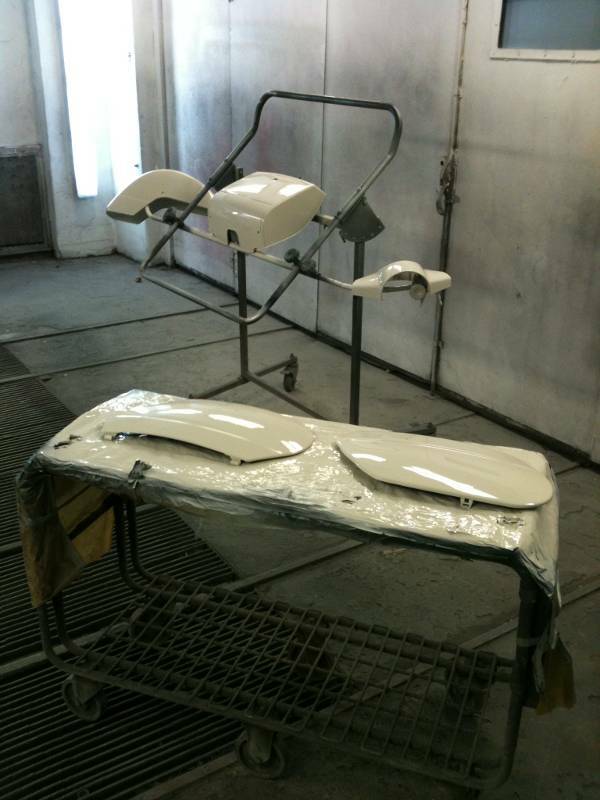 Blasted and with a coat of primer. Now I thougt I was almost there. 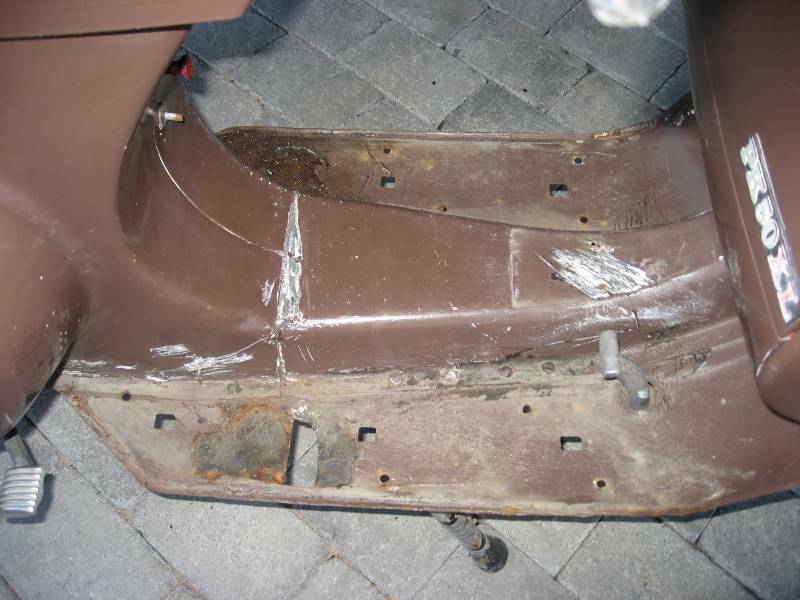 But the bodywork had just begun. Dents where knocked out. Sanding sanding and sanding again. Now i started buying parts form Sip and other places where I could find them. A lot of parts. The front hub was in so bad condition that it had to be replaced. The list of parts I had to have increased. Nice to have as well. I was scared. This project was going to cost. Finaly I decided to stop thinking about it. The project was going to be completed - whatever the cost would be. Professionally I work at an office. 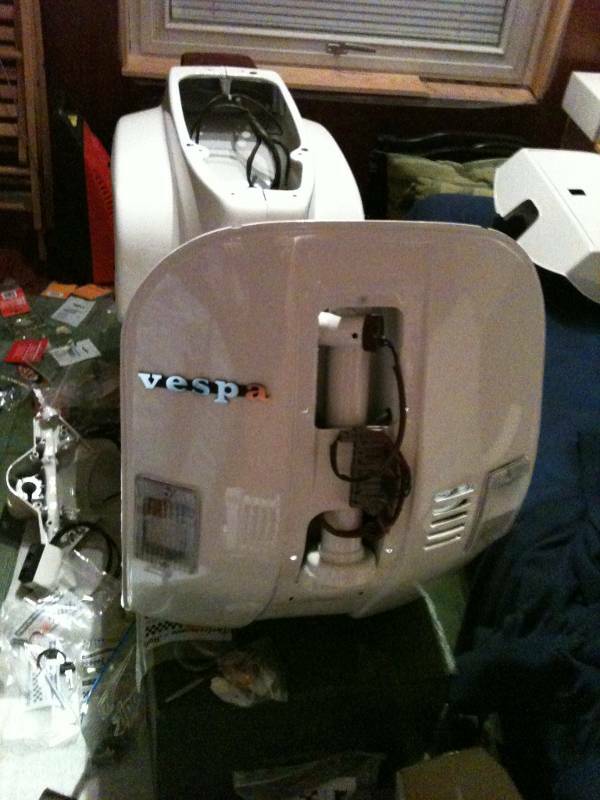 The Vespa was and is my hobby. A way to get my thoughts off work. If I needed to unwind, the scooter got my full attention. You can not think about tasks at work whilst sanding small scooterparts. Honestly I loved every second. Ok.. a small lie. Sometimes I wanted to sell it to another idiot with more money than brains. Looks Like it is going great so far!!! 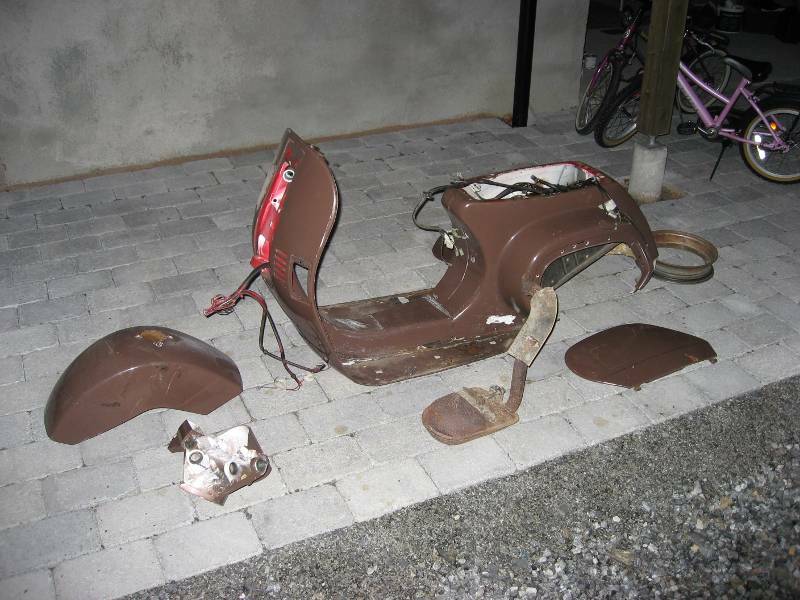 All scoot restorations take on a life of their own that eats up your life!! I am guessing that there will be more pictures to come..?? After sanding and priming for a long time I had to stop. I could still see imperfections on parts that I had worked on for several hours. But enough is enough. I guess I would still be staring at the parts at different angles if I had not decided to draw the line. Now I had to decide what color I wanted it to be. I had, for a long time, wanted it paited black. Then orange. But the decision landed on white. As close as possible to the original color. This was not because I am a puritan. 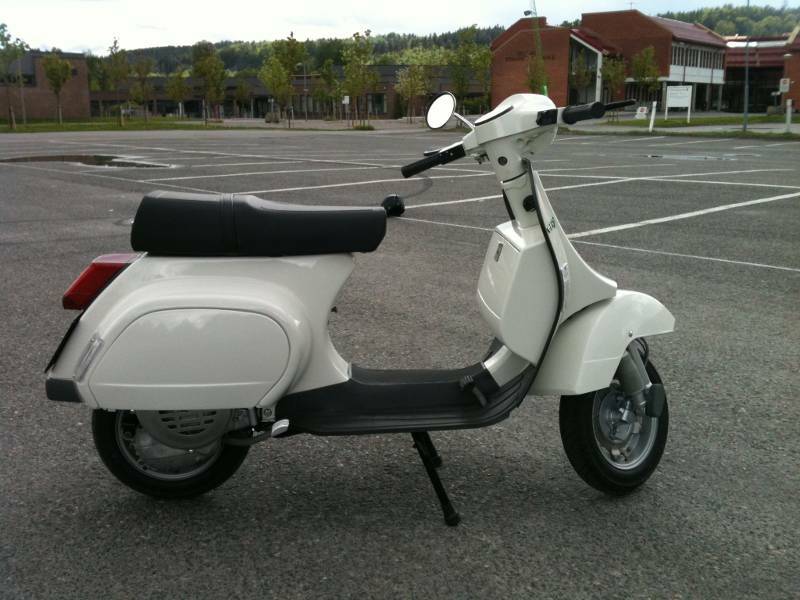 If you look closely on the images to come, you will see that the scooter is far from a standard PK50XL on several details. 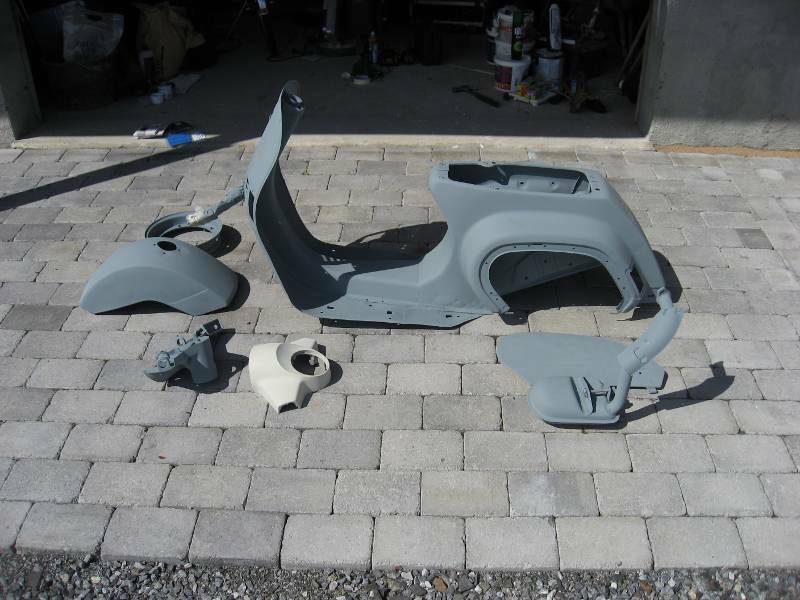 It was wonderful to see that the parts finally got paint. In our garden we have a shed that I built a few years ago. This became the home of the project last winter. 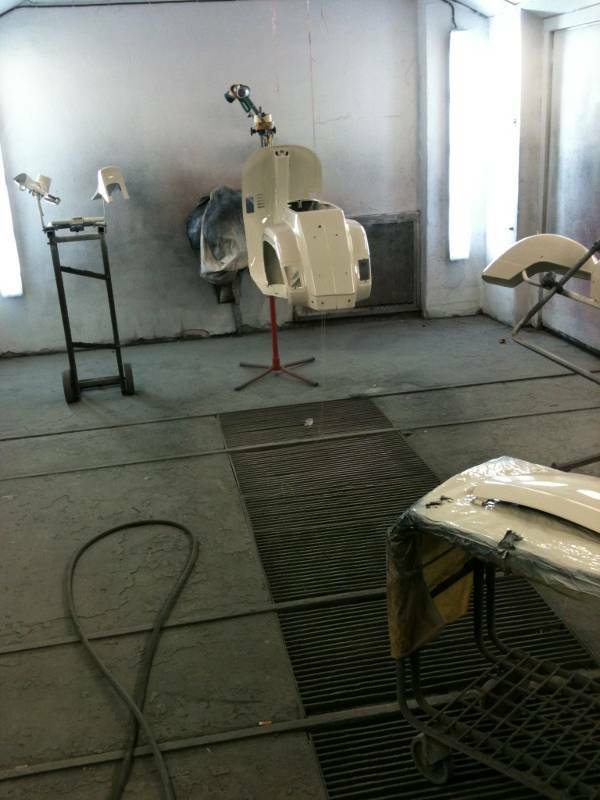 All the fresh painted parts was carried inside. I could not wait to begin the final assembly. 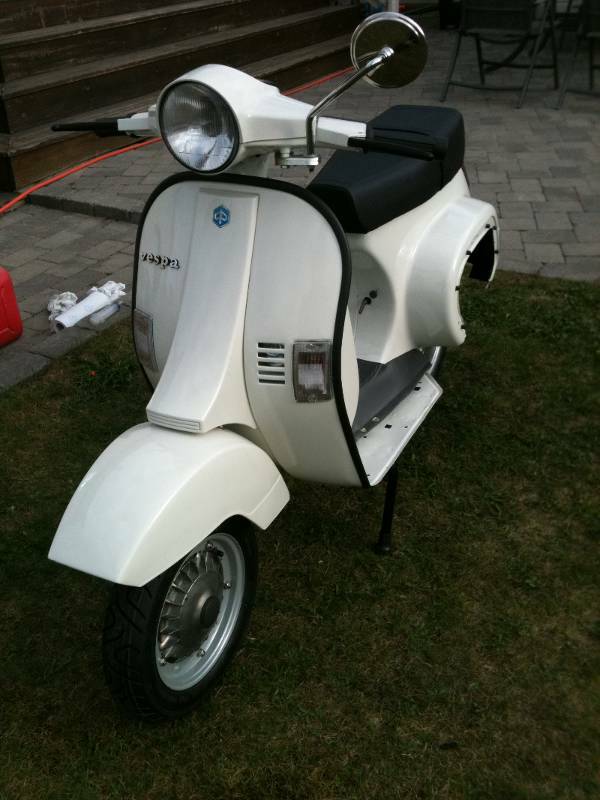 The first part I put on the chassie was the Vespa decal. After a few days I had a rolling chassie The engine is a PK50XL2 engine. I managed to destroy one engine casing while trying to restore the original PK50XL engine. Because of this, I will have to rebuild the hedset to make the gears work later on. I have not done this yet. Never seen how it can be done.. If anyone out there knows how to do it. Please let me know. So..... This is the story so far. Now I have only a few things left until it is done. I posted more pictures today that shows how it looks now. You have brought that back to life and given her 60+ years! Great job... I know it is a 1991, so not that old. but most excelent job!! After a few days I had a rolling chassie The engine is a PK50XL2 engine. I managed to destroy one engine casing while trying to restore the original PK50XL engine. 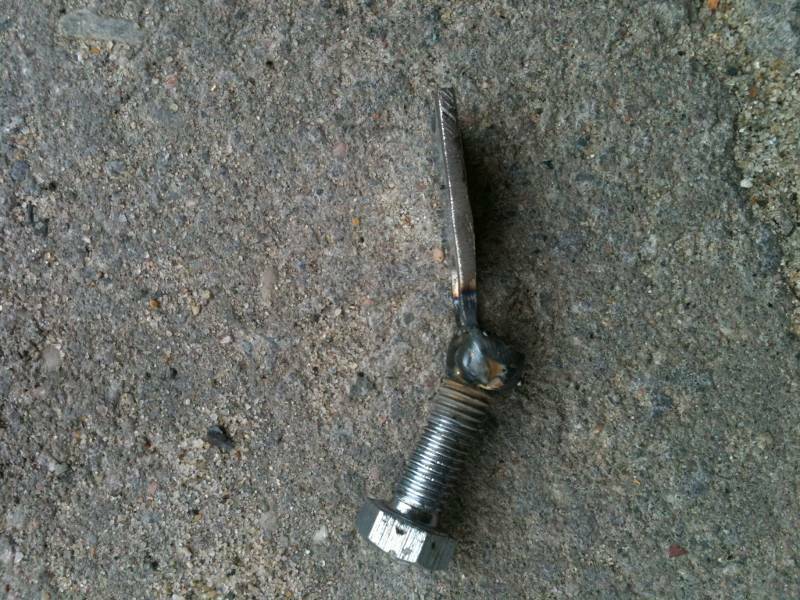 Because of this, I will have to rebuild the hedset to make the gears work later on. I have not done this yet. Never seen how it can be done.. I anyone out there knows how to do it. Please let me know. Do you mean your engine is a single cable system and the chassis is from a standard 2 cable system? I don't think it can be easily done. The system for the single cable isn't in the headset but a pulley in the chassis. I think there is a diagram in the PKXL2 workshop manual supplement, but I'm not sure. I have a friend with one of these engines and I'm convinced it's easier to get a different engine. It may be possible to convert the gear selector in the engine but you'll have to open it all up again. Just to be picky, I don't think that fork is original. I think that fork is from a PK50s (about 83-84, V5X1T). It doesn't really matter, but just pointing it out FYI. DanO at Sportique Scooters has done this. You can call 1-877-TWO-STROKE in order to track him down. 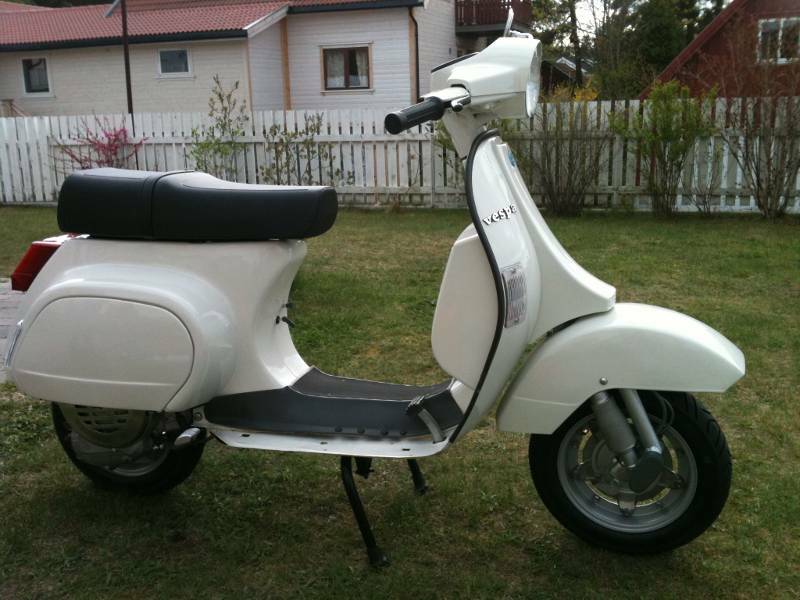 There are some photos of the scooter on facebook in Sportique's albums. *edit: Sorry I didn't see you you were in Norway until after I posted this, try emailing DanO at this address: denverservice@sportiquescooters.com. Thank you for the tip about DanO. Will try to mail him. The fork is brand new, but it is identical to the one that stood on the scooter when i bought it. See first and last image posted. 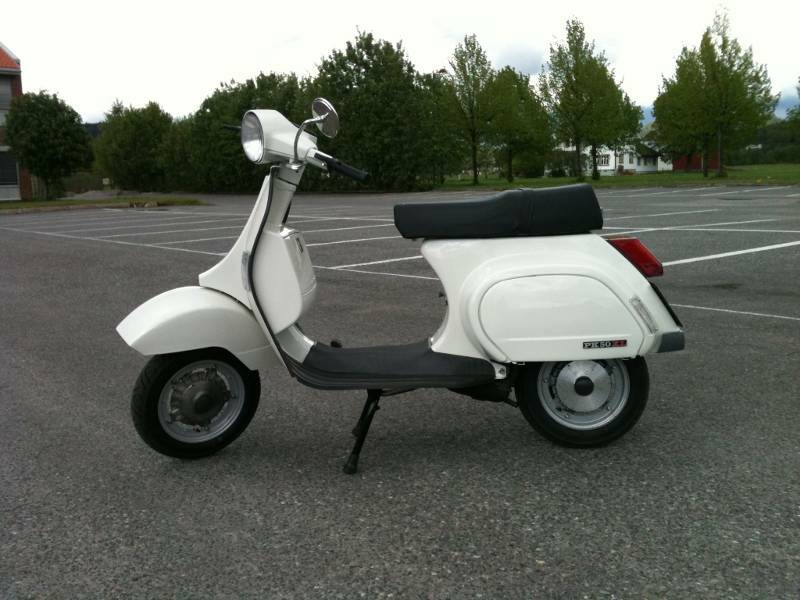 Btw - the scooter is a 90 model V5X3T. Took a look at the paperwork yesterday. Lovely looking machine, you did great! I don't doubt that the frame is a V5X3T, but those came with a different fork when sold new. Spent some time in the shed today with the gear problem. With a little pipe from the garden hose rack, a part from the handlebar of a XL2, it seems like I can modify my handle bar to use only one stiff wire. It is still some unsolved issues, but I think I have enough clearance to reach all four gears under the handlebarcover. Will continue tomorrow and post a complete description as a technical advice, if I solve it. Wish me luck. Fantastic. You'll have to take more pictures. I was under the impression that the single stiff cable did not reach all the way to the handlebars, but made a change from a 2 cable system to a 1 cable system somewhere in between. Will to that. All issues are now solved, but I need a coupple of days to figure out a permanent solution for fastening the gearwire to the lower part of the handelbar. Have used a plastic strip and had a suksessful testride. When I take it all apart again, I will take photos of the whole rebuild. I started with a piece of metal that was about 3mm thick. 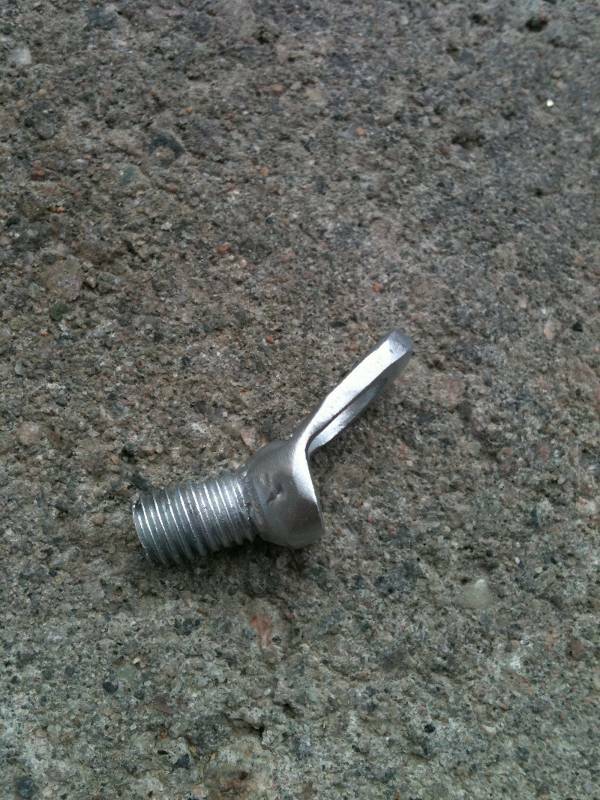 Bendt it to the right angle and got a bolt welded on it. The angle of the bend makes sure that the PK50XL2 wire will allign to the upper gearwirehole in the headset. 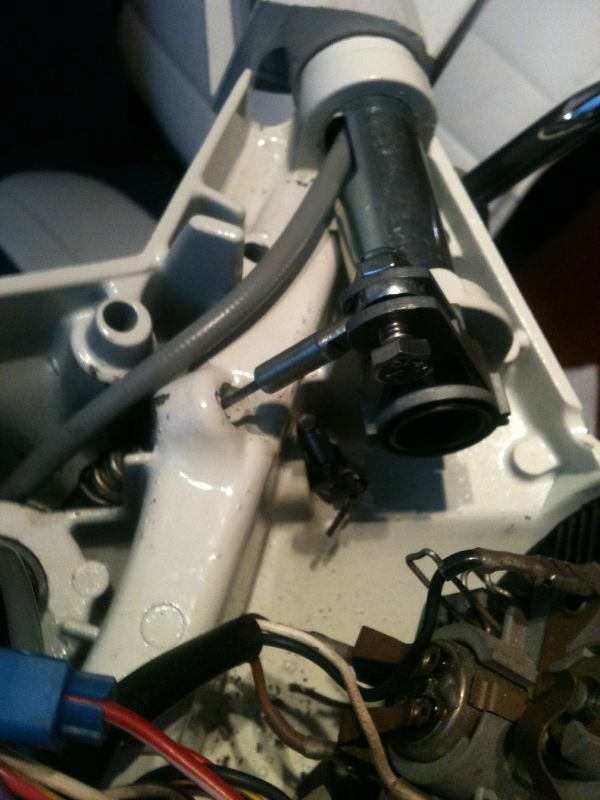 The hole in the metal piece shown in the pic abow is the same size as the tip of the PK50XL2 gearwire. Then I cut the bolt and grinded down the metal piece so it would not have any sharp edges and take as little place as possible. 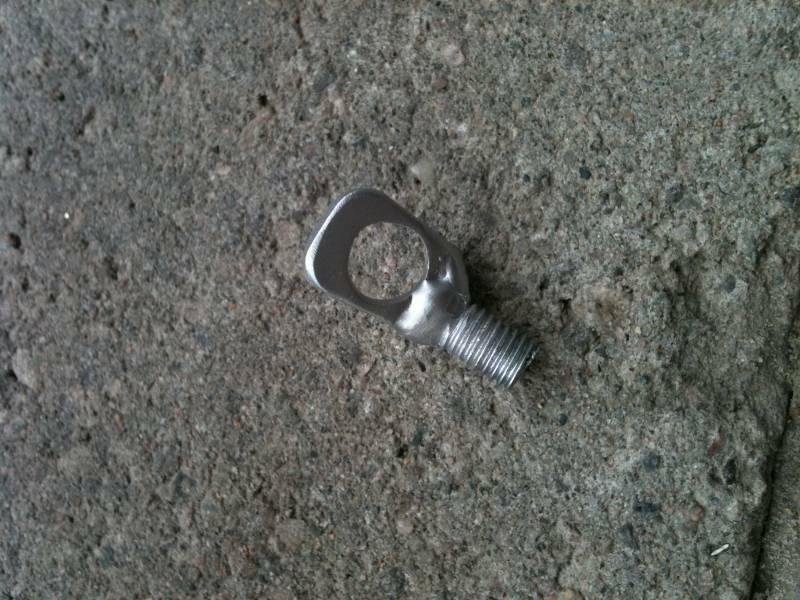 The length of the bolt should be longer then shown on the images. 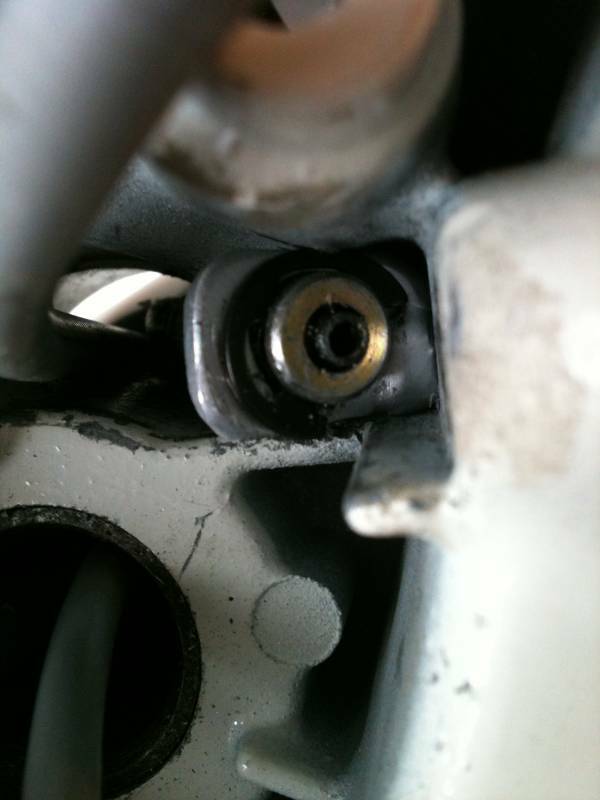 This special part (only for you my friend) is bolted on to the lower gearhole in the headset with a washer and nut. The cable (original PK50XL2 "stiff wire" is fitted in my homemade part and secured with an E-ring. Since the metal piece is 3 mm thick the "slot" for the e-ring appears where it should be. 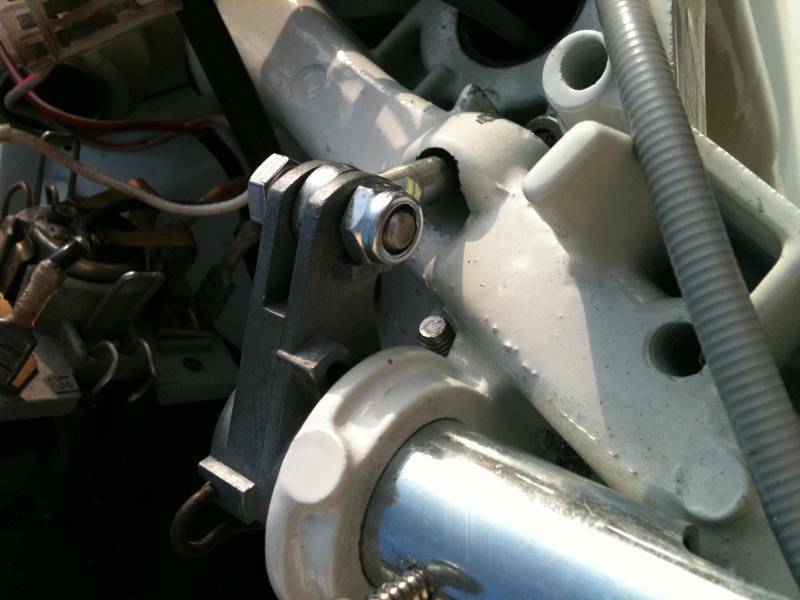 This photo is taken from above looking through the upper gearhole and down on the fitted wire. As you can see, now the innerwire can be installed. 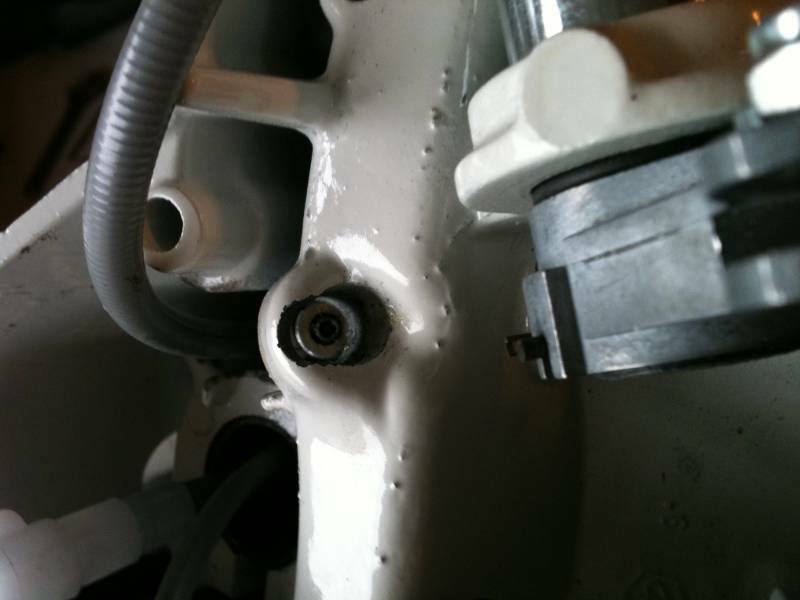 The last part was to fasten the gearwire to the selector on the engine. The wire is long enough to reach all four gears. On the image the scooter is in first gear. The cable is now pushed down between the upper end lower gearwireholes. I had to widen/angle the upper hole with a file to make it fit. The brilliant part of this mod is that I can convert it back if want to without having to repair the holes. The original plastic cable ends will still fit. I used an original PK50XL2 gear roll on the end of the gear tube. This does not fit on the PK50XL gear tube. 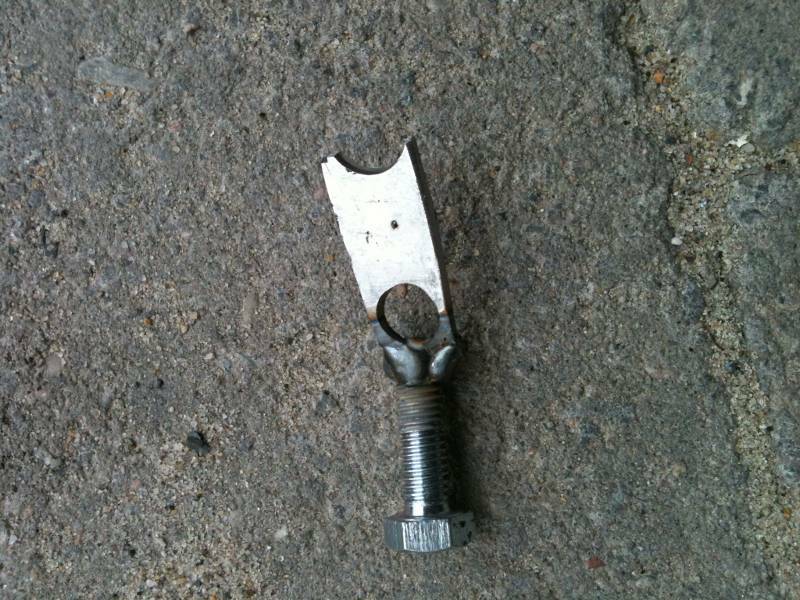 To fix this, I cut off ca 2 cm and pressed in a new inner tube with a smaller diameter. (from the garden hose rack). On the road... at last.. 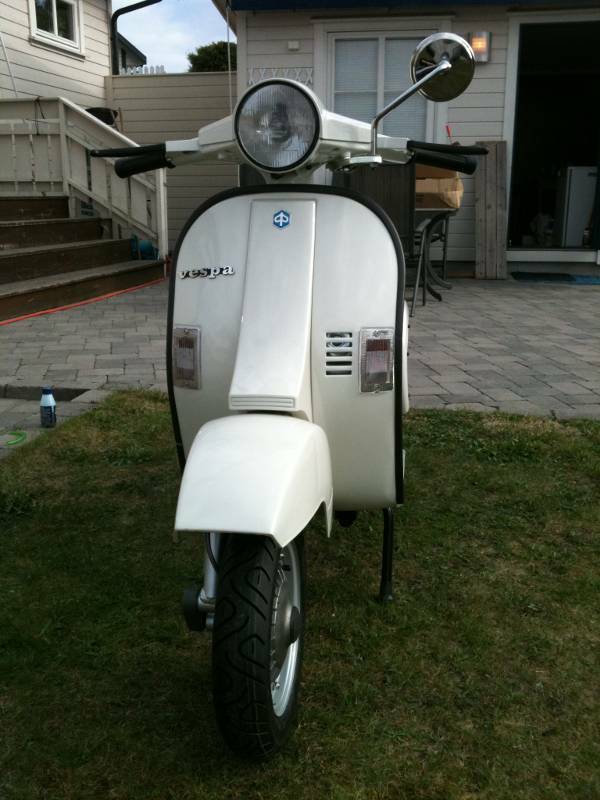 I got the licence plate back on the scooter last saturday. Had to take it for a spin. A strange feeling now when the project is over.. What to do now? Very nice!! As far as what to do now, just ride & enjoy it while keeping an eye out for your next project. 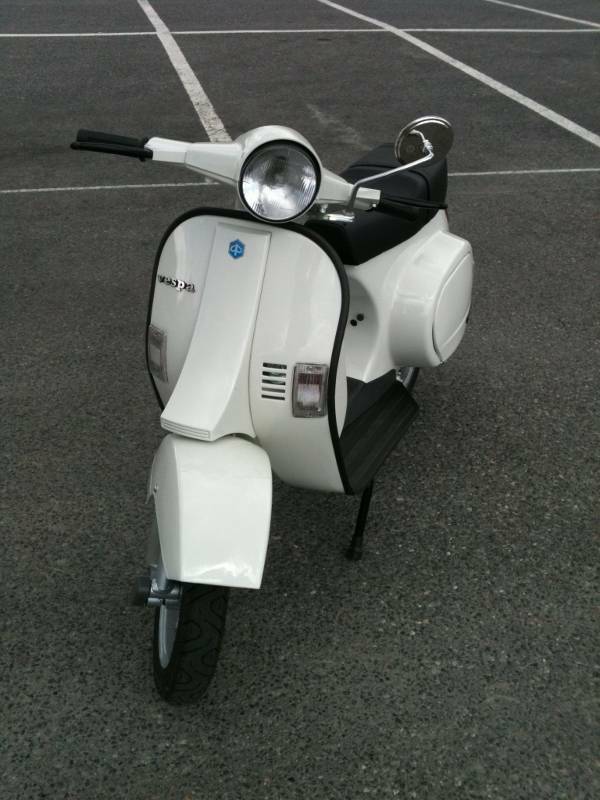 VESPA PX 150 2005 MOD. Very well done !!! Congradulations ! !